Are you ready to party? Leap Joy Inflatables has all the Statesboro Inflatable Rentals that you want for your next party or event. We have lots of inflatable rentals to choose from, such as: bounce houses, combo bouncers, giant slides, and more! We have more than just a classic bouncer, Leap joy is proud to offer a fun selection of themed bouncer rentals that go great with kid’s birthday parties or themed events. Click here to see our Football Bouncer! 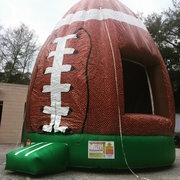 This fun jump house rental is perfect for the football season and football parties. Get this rental for end of the season parties! You can have these bouncers set up just about anywhere: parks, backyards, gyms, and more. We have larger inflatable rentals too. Click here to see our Obstacle Course Rentals!